Restaurants often use food steamers to maintain or warm food. Recently, new water-efficient, connectionless (pressure-less) food steamers, which have no water line or sewer discharge line, have been developed. This type of food steamer is intended for small- to medium-size restaurants. 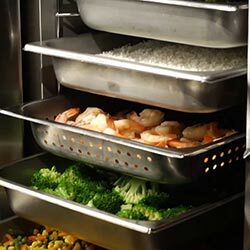 Based on data from a study done by the Food Service Technology Center, the connectionless steamers save an average of 81,500 gallons per year with an estimated 10-year life. Rebates are available for qualified connectionless food steamers, with more than ten manufacturers offering water-efficient models. Click here for a list of rebate-eligible food steamers. *Additional rebates may be available through SoCal Edison, The Gas Company, and San Diego Gas & Electric.